Yea, I enjoyed my little MCT in good seeing, well collimated, and cooled to ambient. I am feeling you. I'd like to journal everything I experience with the VMC scope on this thread in case it may benefit someone down the line. With that in mind I'll make mention of the Vixen flip mirror that is part of this scope's features. If you read around on the internet you'll find a lot of disparaging remarks about it. Flimsy, plastic, breaks, doesn't align properly, etc. As for mine in particular, it was tilted at an angle in the horizontal, and also didn't intercept the light cone at a 45 degree angle when the mirror was engaged by turning the knob up. More like 60 degrees, which sent the light cone off-axis through the eyepiece. The mirror itself is fine, it's just the mount and flip mirror system is plastic/nylon and as you might guess, not likely to be in exact alignment. I shimmed it in the horizontal several weeks ago, but left the vertical as is because I wanted to be able to disengage the mirror at times. But yesterday, as an experiment, I decided to shim the flip mirror in the vertical axis such that it intercepted the light cone at 45 degrees. Then I checked collimation, outside with an artificial star 50 yards away and then on Procyon, which was at 45 degrees elevation. The star test on Procyon was gorgeous. I could see no difference between both sides of focus and they looked textbook. Next I swung over to Orion. What I noticed was on bright stars the diffraction spikes were now smaller on the bottom side and balanced with the top side spikes, but prior to shimming the flip mirror they were very elongated and distracting on the bottom. Now here's what the big plus is of having the flip mirror properly set: I could see deeper. On many previous nights I could only spot down to mag 10 stars, but last night I suddenly noticed a star around Meissa I hadn't seen before - it was a mag 10.5. To confirm I observed both M41 and M35: yes there were more star visible in both clusters. At this point I'm going to leave the diagonal set where it is and not bother with the flip mirror system. It's not a bad concept, it just isn't executed well. Other than all the quirks of this scope I've mentioned in this thread, I love the optical performance of my VMC. It's made me a fan of Cassegrains. I'd read before they were capable of apo-like performance and I believe it! Speaking of which I see GSO is manufacturing classical cassegrains with quartz mirrors for quite a nice price. It's flying under multiple banners: Orion, AstroTech, Guang Sheng. Very tempting. Edited by nirvanix, 22 March 2019 - 02:31 PM. My latest experiment for the little VMC: flocking. On the weekend while staring into the belly of the beast I noticed the walls were quite shiny. Figuring that if I could see it then the primary mirror can as well, I went into action. I had some leftover Protostar flocking paper after doing my dobs and refractor so the Vixen got a good flockover. I've only been able to test it during the day time as the weekend was cloudy. Using my usual 100-yds-away chimney test gave some positive results. Contrast/color saturation was obviously enhanced. Not sure if that will translate to much under the stars? Perhaps on the Moon/Jupiter/Venus. I feel flocking my dob was one of the most positive mods I've made to it, so we'll see how the VMC does. Edited by nirvanix, 26 March 2019 - 03:00 PM. One thing I did early on even before I worked for Gary Hand is when buying a cat was to first collimate the scope, then put whatever diagonal I planned to use in it, then collimate it to the same point. I once pulled a bunch of branded diagonals out of our used collection and tested them all and found that none of them were 100% collimated. Surprisingly (or maybe not) the one in the best collimation to start was an Intes one (also the easiest to align, which is why I still have it for this long even though its not dielectric coatings). We are of like minds photoracer! On my frac I collimate without and then with diagonal. I more or less did the same with this one, although using the skewed flip mirror made it challenging, to say the least. I know yours is the VMC95L (according to your avatar). Use Gamma Leonis (see below) to see if your telescope is really well collimated. The pair and airy patterns look beautiful in the eyepiece. 1. It took me 6 months to collimate my Vixen VMC 110L. 1.1 The Chesire collimation tool is pretty much useless. 1.2 Intra- and extrafocal star test is pretty much useless except for a very rough estimate. 1.3 The only true test is the focused star. I bought a 5mm eyepiece (approx magnification 200x) so that I can see the airy disc and rings and started tweaking the focused star pattern until I got very good airy patterns. I am not saying they look textbook like but I think they look very good. But again it took me 6 months. Why do I say the extra- and intrafocal star test is useless? Because I cannot see a difference before the bad and good collimation except in the focused star. 2.2 Iota Leonis. Very difficult. In theory the 2” should be easy to split in a 110mm instrument. 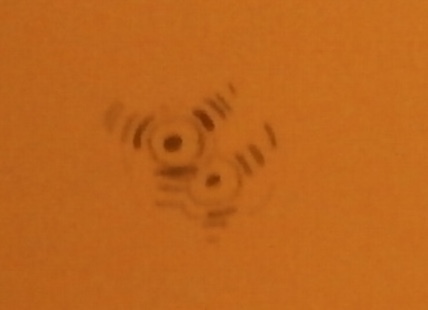 But as you can see the companion lies very close to the diffraction pattern of one of the spiders and is very easily washed out in average seeing. The drawing (not to scale and for illustration only) cannot do justice for bad seeing where the two stars dance around and the 3 diffraction effects from the spiders are all over the place; good luck making out the companion star in such a situation. The second drawing convinced me that I have definitely split the pair and this was when mist and fog was drawing in and the airy rings were barely visible. The arrow is the direction of travel in my telescope. 2.3. Epsilon Bootis. Not easy either because of the diffraction effects of the spiders under average seeing. I only convinced myself I had split it under very misty conditions (similar situation to Iota Leonis) when the diffraction rings were barely visible. Apart from that the curved spiders do a good job and are absolutely not noticeable for dimmer stars or say in globular clusters and open cluster. Edited by Magnetic Field, 06 April 2019 - 04:32 PM. Thank you so much for this wonderful post MF. I think I'm going through the same experiences you did with the VMC. I agree the in-focus star is the best way to judge collimation. Everything else is a rough guide, but a tightly focused star is the ultimate judge. I've had mine in excellent collimation, and in that state it is a masterful star splitter. It can focus starlight to a fiery point. Alnitak, Porrima, beta Mons, Izar have all fallen prey to this little doubles hunter. I try out gamma Leonis pretty much every time I'm out as an indicator of sky conditions, as well as Meissa. I did try iota Leonis but didn't get it. I will try again on another night soon. I got it with my 4" refractor so should be doable with your 110. Currently I'm having a slight issue with the scope going out of collimation on its own. Just taking it in and out of the house. Not sure why. Maybe I've backed out one of the screws too much. As well, I added a smidge of thickish grease to the central baffle. It gives the focusing action just enough tension that I don't skate past best focus too easily. What I like about this scope, despite it's collimation woes, is how it concentrates starlight. Fiery little balls I'd call them. I think the VMC 110 would be the perfect travel scope, and I might at some point look to buy one. Edited by nirvanix, 06 April 2019 - 03:42 PM. According to this table a Strehl of 0.75 for an obstruction of approx 36% (VMC 110L) is not so bad. 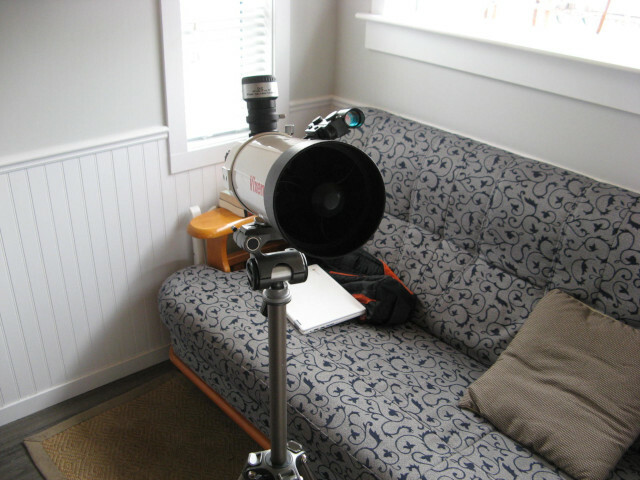 Okay, I admit no end user should be required to disassmble and assemble a telescope to bring it up to speed. This is just rubbish quality control. I have no sympathy for Vixen for that crap that rolls out from their Chinese factories or suppliers. He uses Strehl in absolute sense 0-1 independent of the obstruction. The second C14 sample (see Figure 11 in the following link) has a Strehl of 0.75 and rms of 1/12 similar to the Vixen (in the above link). He claims it is not diffraction limited though. Edited by Magnetic Field, 16 April 2019 - 05:41 AM. Great post MF, thanks. I'll spend some time looking at those links. I'd prefer to get individual strehl readings for each optical component. It's a lot more telling about the quality of optical manufacture. I have in fact basically taken apart and reassembled my VMC 95 over the last month. I'm glad I did as it's improved the performance and provided a learning experience. I do agree that Vixen should make an effort to do some quality control in their Chinese facilty. Personally, I think they'd be better off making ALL their own optics and sourcing mechanicals from GSO or the like, then do final assembly in Japan. I used the VMC in straight-through mode for about a week to see what the user experience would be like. The image is a little brighter of course, but it's a neck-breaking exercise! I couldn't do it on a long-term basis. So yesterday I carefully squared up and then shimmed the flip mirror to be correct in both axes when engaged. My AstroSystems LightPipe was a big help in this. It's a versatile tool. As a reward there was a clear evening sky and a nice high moon. Started with low powers on the moon and also M35, M36. The flip mirror didn't seem to add in any distortion to the view. Time to get brave. I plugged in my WO SPL6 for 175x magnification, then pointed at a star. Collimation was on the spot. Swung over to Porrima. What a gorgeous split at that mag, with lots of blackspace, and a perfect first diffraction ring. Back to the moon. I'm happy to report the moon was just as sharp at 175x as at half that magnification. That's nearly 50x per inch of aperture. I was giggling with delight. The design and the scope has potential to be a great portable daytime/ nighttime instrument. Of course my experience out of the box was no occasion for giggles, rather grimaces! By the way, adding a bit of thick grease to the central baffle slide has really helped me tame the focuser action. Much more user friendly now. Edited by nirvanix, 16 April 2019 - 12:13 PM. How did you shim the flip mirror? Is it a permanent solution to last? I am wary of touching the flip mirror. I have got a Chesire collimation tool (the short tube version) but it is useless. I was wondering if buying a star diagonal or prism would be the better idea. Hi MF, I'm using some small cut pieces of sponge to shim the mirror. They are tucked below and at the side of the flip-mirror mount, so they don't exert any pressure on the mirror itself. I'm going to leave it like this since I use the scope with the top port, and don't do AP. No flipping the flip mirror for me, but I don't mind as I'm now content with optical performance. I guess you could call it a temporary permanent solution! I thought about buying and inserting a diagonal in the rear port, but I worry there will be some vignetting and loss of brightness on DSOs, although apparently Baader sells a 1.25 inch diagonal that can (nosepiece removed) screw directly onto the T threads of the visual back (after removing the eyepiece holder), and may alleviate this concern. As well, using a diagonal somewhat defeats the purpose of the "ultra portability" that first attracted me to this scope, so I'll stick with sponges for now. Something I may try on a kayak trip is to bring the VMC without a mount, and use the rear port with a long fl wide field eyepiece in the fashion of a binocular or spyglass. I think it could work quite well like this for day/night use, especially if you can prop yourself up against the ground or a tree. It certainly is as light or lighter than may binocs. Had the scope out at 5am this morning as the GRS was front and center on Jupiter. The details were there, but very faded. The result of a 15 degree elevation, and a large central obstruction. Definitely my 4" refractor has a little more contrast, but nothing like when Jupiter is above 30 degrees. A fair appraisal of the VMC on planets won't come until I can view Jupiter at higher elevations. Edited by nirvanix, 17 April 2019 - 11:59 AM.